Think about ambiguity in your art. To be ambiguous means to give double — or more than one — meaning. Ambiguity is one of the main reasons installation art attracts. Different, perhaps, from the “quality art” that most of us strive for, it’s the “quality idea” that engages and bends the mind. 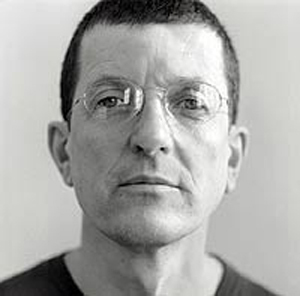 Antony Gormley is a British artist who deals in ambiguity. 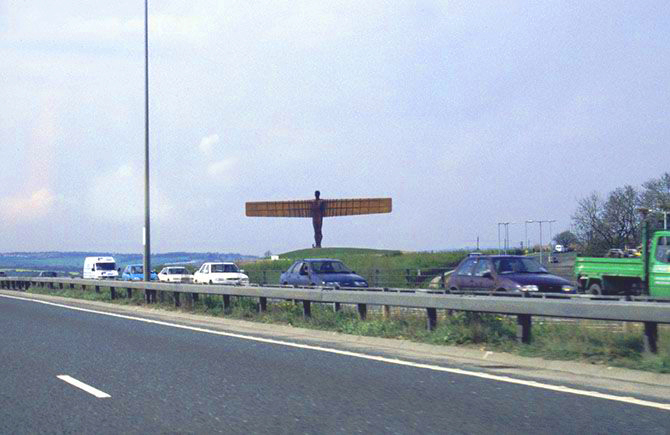 Angel of the North is a massive winged figure that overlooks the A1 motorway near Gateshead in the UK. Rising on the horizon like one of those ballsy bulls that formerly advertised brandy on the skylines of Spain, it’s a modern-day Otto Lilienthal about to take the leap. As the believable technology of possible flight, it feels like a tribute to the century in which man finally mastered the air. Then again, perhaps it’s the Egyptian Goddess Isis winging over her subjects. Or is it a hilltop crucifixion–man crucified by his own technology? Or an ornament, like a car badge that happens to be made large, as “big” artists are wont to do these days. Gormley raises the stakes on rural and urban installations by embracing enigma and looking for the potential of ambiguity. What are those bronze people doing standing on London rooftops or knee-deep in the Crosby tide looking wistfully out to sea? 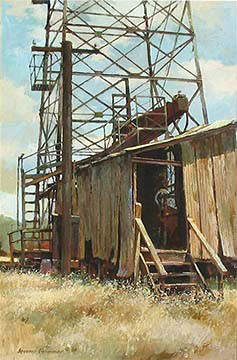 “Angel” was completed in 1998. It’s made of Corten steel, weighs 200 tonnes and has 500 tonnes of concrete foundations. 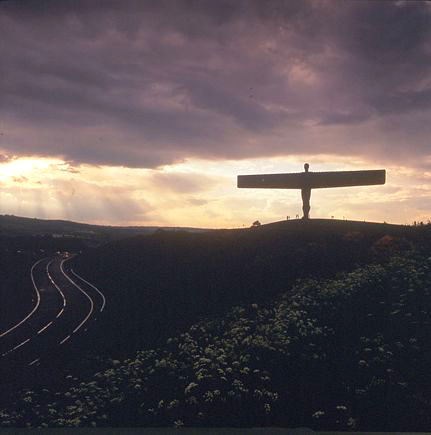 It’s the largest outdoor monument in the UK. Gormley has asked himself, “Is it possible to make a work with a purpose in a time that demands doubt?” Without giving too much away, he says, “I wanted to make an object that would be a focus of hope at a painful time of transition for the people of the Northeast, abandoned in the gap between the industrial and the information ages.” Could anything be clearer? Ambiguity need not be in your face. Ambiguity, particularly in the long term, may be most effective when subtle and hard-won for the viewer. Windows suggest eyes, trees reach for the sky and pray, rocks have relationships, rivers have ambition and disappointment, patterns of snow or sky have secondary patterns that tell another story beyond the obvious. People are birds and can fly. Everyone enjoys a mystery. Some people will go to great length to find one, regardless of whether there actually is one to find or not. I try to work a message into my art when I can, and I’ve found that an ambiguous one is a far more compelling one. As a painter, my first intention is to stimulate the visual senses. However, if the subject of the painting allows, leading the viewer into a mystery in the interpretation of the painting adds another dimension and possibly a more personal interaction with the art. 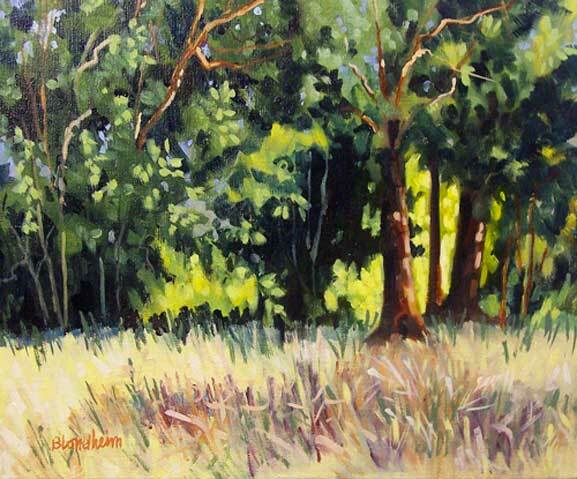 A painting becomes a favourite, based not only on how it looks, but also on what it may have to say. There is something to be said for getting more than face value. Ambiguity in art can create a living, breathing response to the work. We create in a particular moment, in a specific intellectual or emotional state of mind. Once time and circumstance has changed, so does our perspective and hence our interpretation. 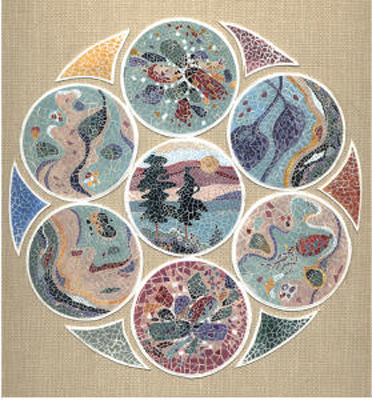 This activity, which allows for an exchange of thought and response, feels like the flow of the creative process itself. How wonderful for artist and art appreciator alike to have the same benefit brought about by an open-ended conversation. What does it mean? The question may stay the same; the answers usually differ. The creator can be quite astonished at what his creation has brought forth. It is the mystery bag of creativity. No one knows what he will get, yet we all look in the bag to see what’s there. 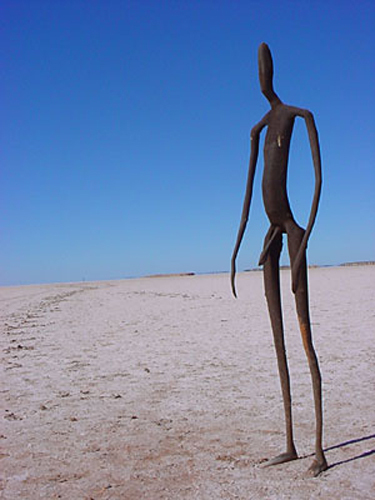 We have these amazing steel sculptures which were formed and installed by Antony Gormley at Lake Ballard near Menzies in Western Australia for the International Festival of Perth in 2002. There are 51 sculptures placed widely apart on this desert-like landscape. Although installed as a temporary exhibition for the duration of the festival, they now stand as a permanent reminder of Gormley’s creative spirit inspired by this ancient land. In April I visited Crosby beach. Crosby district is just outside Liverpool city on the English coast. There, Antony Gormley has installed a whole lot of life-sized naked males cast in metal in the sand. When the tide comes in they are partially or completely submerged. I enclose some snapshots I took there. It was an uplifting experience to be there on a beautiful day. I feel that he has captured our smallness in the universe in a very special, poetic and dynamic way. Ambiguous? They are all male! These figures all look out to sea and are obviously regarded highly by visitors, who even dress them up. Liverpool is the European city of culture in 2008. Fortunately the metal figures have been saved and will remain there for everyone to enjoy. The average viewer has no idea of the mystery and intrigue going on right under his nose. 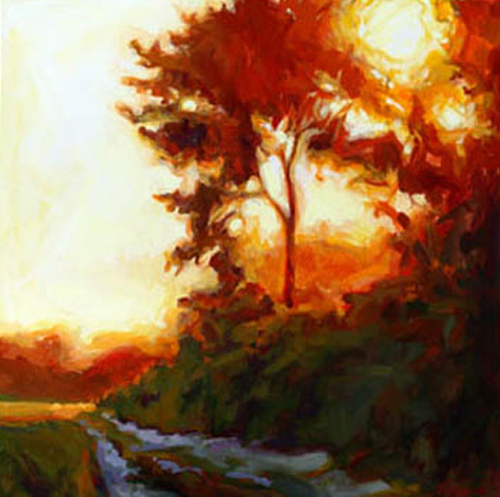 Most artists are using complex and mysterious methods to achieve the beauty in their paintings. 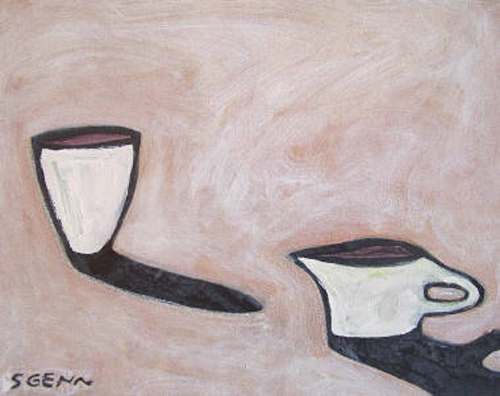 Through the elements of design the artist leads the viewer around the painting with deliberation. Viewers are not aware of the arcane complexities of painting. They believe it just happens. It doesn’t take installation art to create intrigue. Good old fashioned design skill can achieve all the intrigue you need. 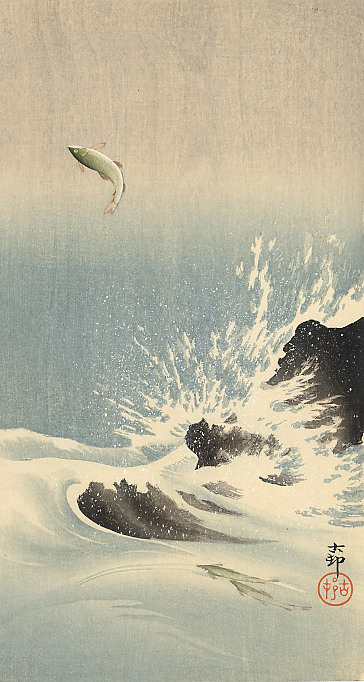 I’ve always marveled at the way Japanese masters can infuse natural elements with incredible, almost human, emotion. It is as if they had honed the ability to embed a whole host of feelings in the most ordinary elements. You not only recognize agony, endurance, and tenacious strength, you also get feelings of incredible serenity, humor, and dance-like movement. Leaves swing like children, tree roots grab the soil with ferocious need, and even rocks can seem to laugh. This is never overt, and yet it is impossible for me to look at a Japanese landscape without seeing human qualities embedded in the painting. Could this be because my own mind has a desire to identify human forms even when they are absent? Possibly, but this doesn’t happen when I look at landscapes done by European painters. Van Gogh’s wild sky and his dancing stars and undulating fields come close, but they are more like pure animation and seem to come from the artist’s own emotion rather than the subtle spiritual infusion the Japanese paintings offer. Anthropomorphism? The word comes to mind. Do the Japanese see something we Westerners don’t see when they look out at a natural setting? Do they feel something different? 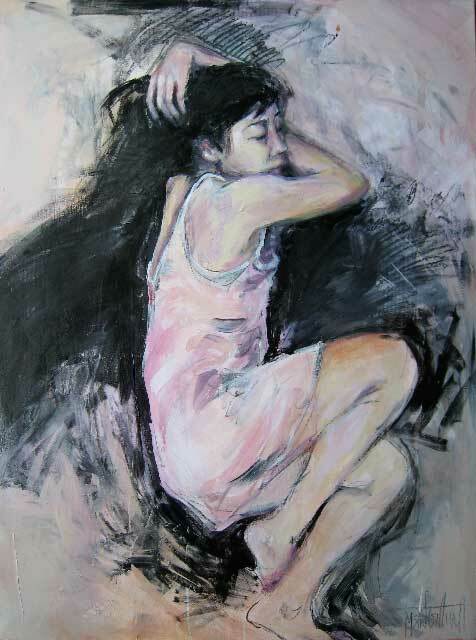 In art, I believe that “ambiguity” adds interest, depth and meaning, enriches the viewer’s experience of the work, and allows the artist to make allusions without preaching. Symbolism, subliminal messaging, even Freudian slips, enhance the way a work can resonate. The most interesting ambiguities may well extend beyond the artist’s conscious intentions, to the subconscious meanings that surface in unexpected ways. As an artist, I am drawn to a mysterious haunting beauty that is often elusive and hard to capture. It is like striving to hit the perfect note in a musical score. So often, my collectors see many things in my work… It is safer to say “what do you see in my work?” when they ask me to describe it. They go on to tell me complex stories of a place once visited or the emotion of love… Indians, eagles, sculls, geishas, and faces in the murky, mysterious, abstract works. I enjoy the stories and the connection that draws them to the art. I often fall short in my explanations and enjoy their versions much more… I then see the face in the water… and share the experience. I have delved into the craziness of obtaining my MFA at the tender age of 47. It is something I have always wanted to do. This letter speaks to the current challenge I am struggling through with my own work. I have discovered that in order to reach more people I have to be more ‘ambiguous.’ At one time, I might have thought that was a cop out. If one has something to say, shouldn’t one say it clearly? Yet, if we say it clearly, it is possible that fewer people will hear it, because perhaps the message is too obvious or limited or trite or sentimental, etc. To leave a work more ambiguous is really to allow it to have a life of its own. 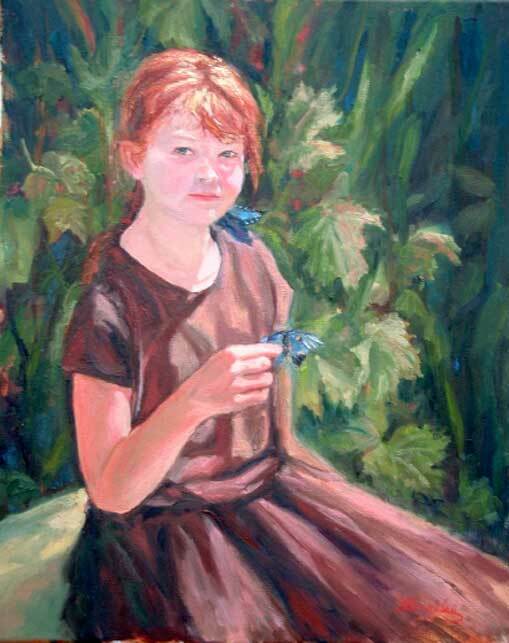 To let the work interact with the many intellects and emotional beings that will encounter it. As an artist, it may be more powerful to gently point in a direction and leave the ultimate journey to the free will of the viewer. I saw Anthony Gormley’s bronze cast figures in London this spring. Like dozens of tourists, my partner and I had our photos taken standing beside the one on the bridge. We also went into his fog box in the Hayward Gallery. 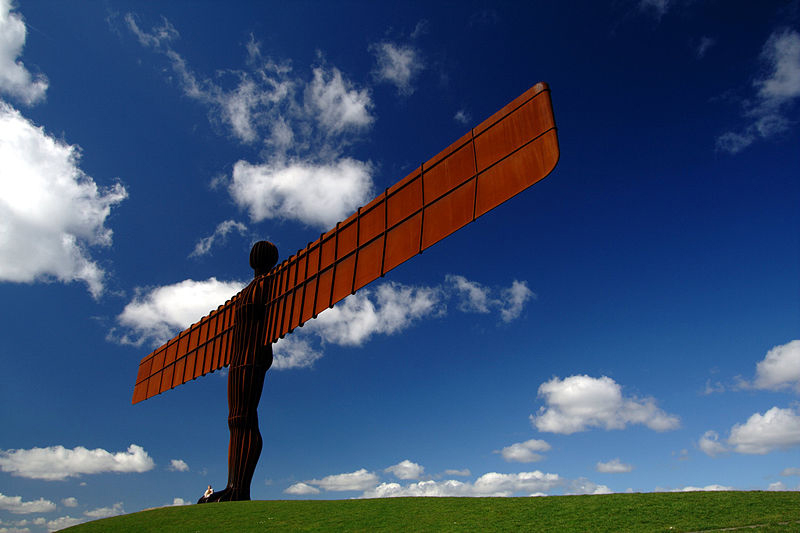 But my question is this… How do you think The Angel of the North manages not to be blown down in the gales that sweep across England from time to time? Such a wing-span! Divine intervention? (RG note) Thanks, Anne. No. Consulting engineers dictated a huge underground concrete foundation and sound structural design. It is built to withstand winds never heard of in England. I may be wrong, but only the Angel’s critics can blow her down. 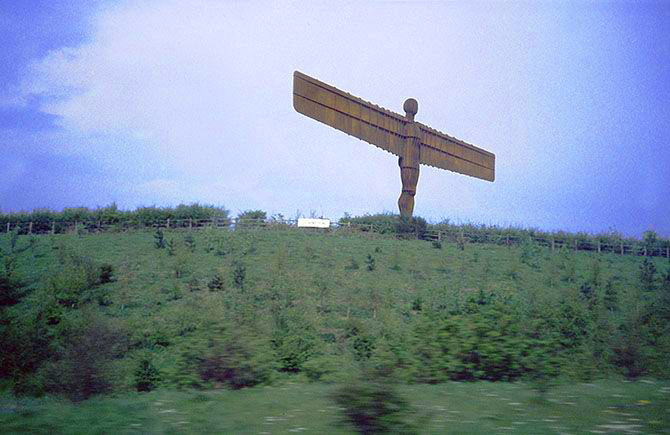 I have seen The Angel of the North and am appalled. A large piece of steel allowed to go rusty. In time it will corrode away or have to be maintained at great cost. The whole heap of junk should have been left in the steel mill, but since it was built to be displayed, the matter of corrosion should have been dealt with in the design stage. A gross waste of metal and other resources. (RG note) Thanks Dudley. Corten steel is formulated in such a way as to achieve a reddish patina in short order and maintain the look without a great deal of degradation. 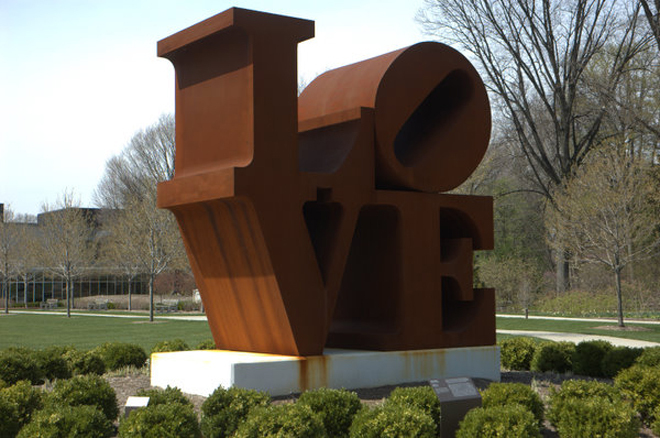 Having said that, Robert Indiana’s much replicated LOVE statue, made from Corten and first installed in 1976, has had to be restored and even painted in several locations. I was entranced by Gormley’s show at the Hayward Gallery in London last spring, a retrospective which included the new piece Blind Light. It revealed an artist moving along an avenue of discovery, using, changing materials, lead to wire to light, as called for. 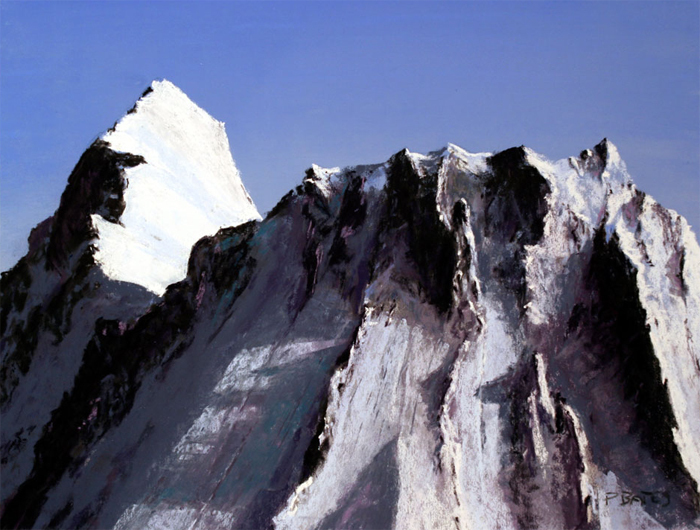 The gap that I sometimes experience with contemporary work between concept and material presence was bridged through his understanding of the implications of his material choices in the expression of his ideas. Here was an artist given over to “bringing to light” the result of his endless inquiry and I saw that his work could be entered at any level. Anyone could walk into Blind Light and have a very direct experience of that which he is exploring, the relationship between our “first body” or elemental flesh body and the second body of the architecture we live inside and the relationships between those. The evidence of the power of heart and mind together in the work was heartening, uplifting. Gormley has stated that the energy behind his work stems from a need to define the space left out by his sculptures… as opposed to the standard “defining” of volume that most sculptors strive for. Funny for a guy who casts his own life size body in lead. This left-out space is as valuable. Using the figure as he does, it’s easy to overlook these other subtleties (the figure is so literal… everyone can grab it as an object metaphor). What I love about his work is the devotion to this human thing and also the cleverness with which he exhausts it. One only needs to see Blind Light (the exhibition). 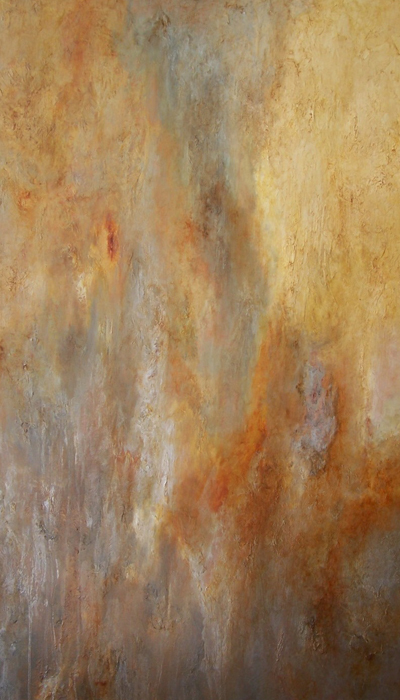 Your article on Ambiguity where you site Gormley’s work as the perfect example, is typical of the seduction surrounding him. Many of our critics here in the UK particularly applaud him because he speaks “critic speak,” and his work, as you state, is ambiguous in nature. Gormley’s sculpture is cloaked in pseudo cerebral explanatory layers. It is repetitious and always about his own body form, usually directly cast. The direct body cast technique is quick, lifeless, bland. 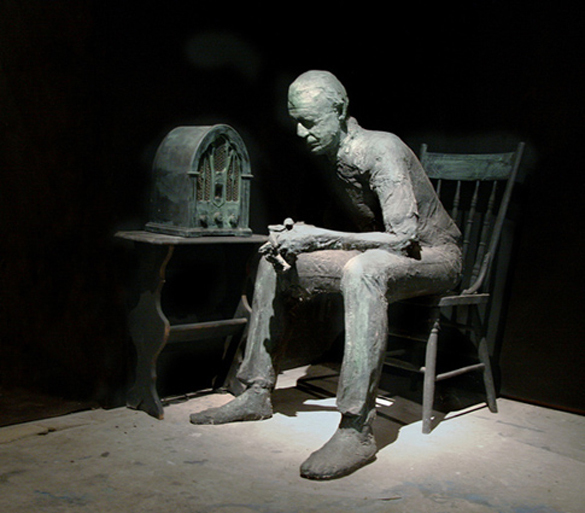 However, with one exception is the artist George Segal who put a little more life in his body casts. The very soul or energy that must emanate from within sculpture that moves, stirs, is lacking in Gormley’s work. Henry Moore has written about just this facet of sculpture. 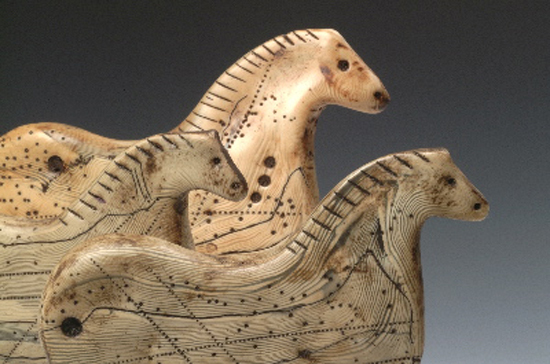 If these elements are present, then the smallest piece of sculpture has this resonance. In terms of scale, if they are absent then the weaknesses are merely amplified, as Gormley’s work shows. 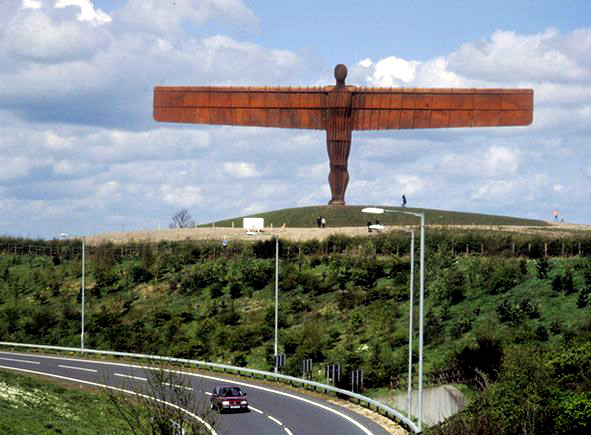 Angel of the North is based upon his own body form with adapted elongated out of scale arms formed into wings. He has used his explanation of it to fit into what the politicians, arts organisations, and councillors of the time wanted to hear. 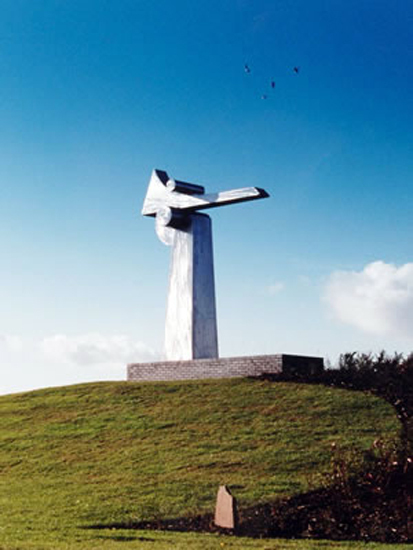 The sculpture was erected because the last Conservative Government, in a desperate move to obtain votes in this most impoverished region of the UK, wanted to be seen to be ‘doing something positive,’ and to argue that they had ‘supported the arts.’ It has nothing to do with re-generation or hope for the region. In previous months they had destroyed the major ship building industries, with the closure of the Swan Hunter Ship Yard. Why ambiguity is so important to create ‘presence,’ is largely due to the simple truth that individuals like Gormley have misunderstood the fact that honesty is a pre-eminent strand in one’s work. I do not see it but hear smart explanation, and charm. I feel that he just makes miles of uninspiring objects which he tries to eloquently wrap in verbal ambiguity. His recent ‘works’ in London have been criticised for their inherent weaknesses. His work he says is about life, about the ‘body, presence.’ Herein is the ambiguity, for none of these energies are present. What is present, is lifeless repetition, for which he is master. When I first studied the Lascaux cave in the ’70s, the common theory was that these beautiful animal paintings were “sympathetic magic,” created to aid and ensure a successful hunt. Only men and adolescent boys were probably allowed to participate in the ceremonies. Damage from spear points suggested their use as target practice, so seemed to support this. Now research shows that these animals were NOT a food source for this tribe. The target practice was committed by another, much later tribe who came upon the cave paintings years after. There is evidence of the presence of women and children in the caves. So what is their “real” story? The newest theory about the purpose of these paintings is something much more powerful, and poignant, and timely: It was an age of great climatic change, and cultural upheaval. Their whole way of life was disappearing, almost overnight. Their very survival was at stake. They may have been calling the horses back. As one writer put it so eloquently, the cave paintings are a message that is not addressed to us. We do not know the meaning, we FEEL its power. We SENSE something big is going on. We SEE the changes in our hearts when we look at it. And we make up a story that satisfies us as to what that is. And that, to me, is at the root of all great art. It moves us. And pulls a story out of us, whether it is the one the artist intended or not. Once Angel was put out into the world, he carried a story, and we will read it with pleasure. But in time, it may not be the one the artist thought he was telling. I am particularly fond of ambiguity between the title and the image, a hangover from my younger days when infatuated with the Surrealists, the masters of ambiguity. I tend to produce an image that would be classed as figurative and uncomplicated intellectually and then throw the observer by having a title that presents another facet to the work. The attached work had a working title of Catch 22 only because I started it on the 22 March. 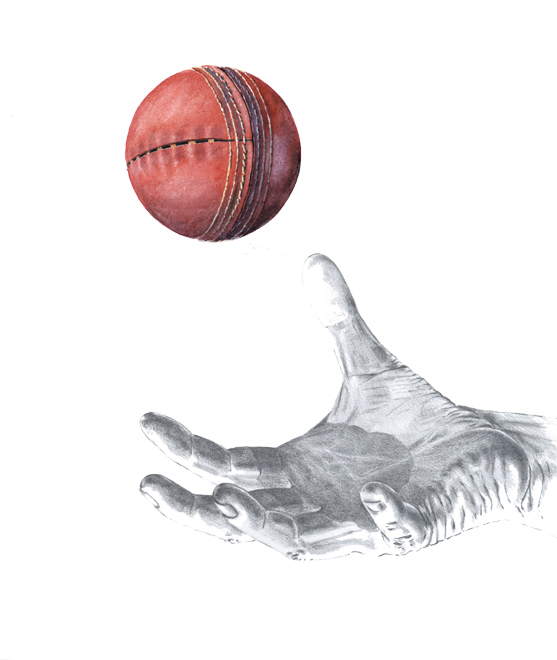 But after I had completed it I felt an allegorical connection between the old, gnarled cricket ball and planet Earth. I eventually settled on the title of Planet in Peril. This title is not complicated and possibly obvious when stated but probably not what the observer would have considered as the content of the work. Firstly let me say your daily subjects intrigue me so much I can’t stop contibuting to this site. Ambiguity is synonomous with Life. It is the stuff of life. We are offered multiple choices. Therein lies the ambiguity. We deal with this in every aspect of our lives on a daily basis. When we think we’ve figured it all out, we learn later that all is not what we may have thought. The cycles of life should teach us that all is not what we imagine. When I was a youth everything was possible. As I reached mid-life disappointment entered my life. As I now reach the “second half” (for lack of a better term) of my life, I see everything I once believed may not be the fact. I’m not so sure about my firmest beliefs anymore. There is too much ambiguity in life. And so it should be with art. 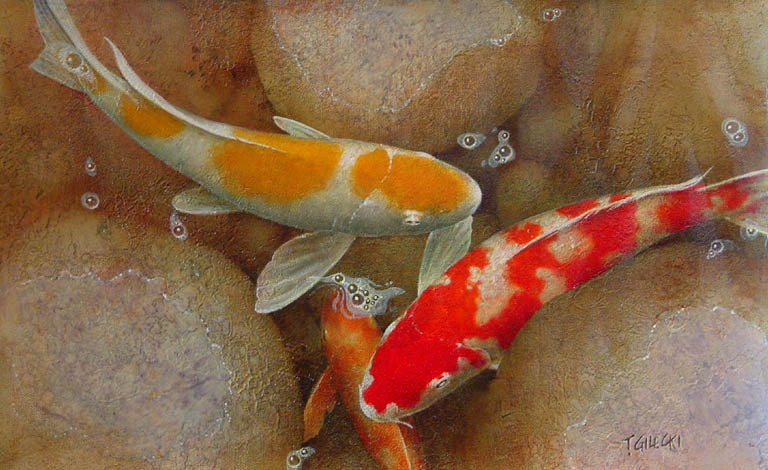 Art reflects life and in so doing should be ambiguous in it’s nature. Art for me is not to explain but to show. Not to conclude but to examine. The results are for the viewers to make their own choices. I’ve worked with horses part of my life and they best personify my belief that you can lead a horse to water but you can’t make him drink. Art should lead, the view makes the choice to drink. All things are inextricably tied to ambiguity. Yin and Yang. I believe this ambiguity, oddly, is what gives me strength. There is no one meaning, no one choice, no one road, no one experience. It’s the mystery that intrigues me to keep exploring. RE: Getting to must: Thank you, thank you, thank you, long have I suffered with this need. It has cost me dearly and I ask myself daily, “What am I doing? Have I lost my mind?” Now I understand and can verbalize “why”. I have moved away from almost all needs on a personal and physical level so I can create art. Thank you for explaining this. I must ask if there is more. More beyond recognizing this need for creativity at any price. What is next? 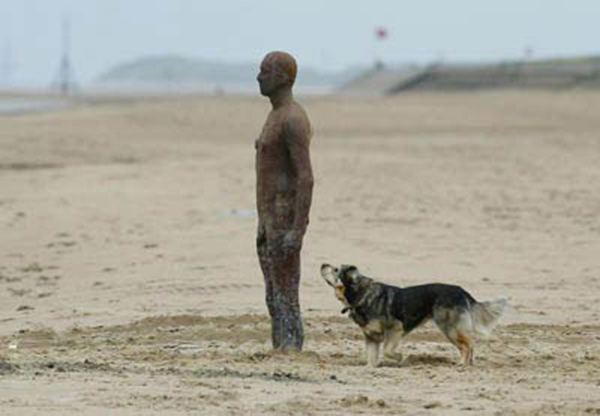 In response to Robert Erskine’s comment, I agree about Gormley’s sculpture. It’s a sham. I have never liked George Segal’s cold depressing realism either – so lacking in imagination. But then there’s the sculptor, Alexander Calder: A long time ago I was working in New Haven, Conneticut across the street from a mirrored box of a building which had a huge red Alexander Calder sculpture in front of it. Every day for a week I looked at that sculpture with bafflement and curiosity. Then one day I “got it” and laughed out loud! Thereafter it made me smile every time I looked at it. It changed my perspective on the building it dwarfed and everything around it. If I could create that effect with my art I’d be thrilled. I just got this email today: “I bought the big Sunflower Original Watercolor and I am having a lot of fun with my friends and family looking for the animals in the sunflowers’ leaves! I didn’t notice them until I hung it in my home.” . . . And I didn’t notice them until I looked at the image on my computer after getting this email! This proves to me that ambiguity adds emotional intensity and viewer interaction. She also said, “My son-in-law thought this watercolor depicted such strength and power – not usual things you associate with the sunflower. Usually the sunflower is pictured bent over.” Would he have felt so strongly if he had not been looking at it so closely? If I might try to answer Gene Martin’s question, ‘What is next?’ I think the answer is found in finding balance in a continuum of needs that Thomas Maslow describes. In practical terms, that means when you are well into your creative self-actualizing state and might even be compulsive about it, you will probably need to go back to the first stage of needs. In other words, get some sleep, start paying attention to a healthy diet, get the chores done, then reconnect with family members, do your part around the house, phone someone you haven’t spoken to in a long time. Soon you will be recharged (or at least free of guilt) and can get into the great state of self-actualizing again. And round and round it goes.